Australian advertisers and agencies can finally access daily audience data with the launch of Nielsen’s Digital Content Ratings this week. This is the final part of the IAB and Nielsen’s three-stage enhancement of digital measurement in Australia. Previously only monthly data was available, usually closer to the end of the subsequent month. I believe the product is brilliant work from the IAB and Nielsen as it is world-leading and also timely given the recent debates around online transparency. Having poked around the interface since last week I can report that the interface works faster than the previous ones, and delivers on most of its promises. At the Melbourne launch event the Nielsen and IAB representatives were also able to articulate their future roadmap of enhancements really well. While this is a good start I believe the online landscape has changed since Nielsen Online Ratings were first launched, and the requirements of digital audience measurement have to keep up with how digital media is being bought today. I have listed a few pros and cons below. The cons are not all specific to Nielsen DCR but for the entire spectrum of online measurement. First up the granularity in data is exceptional, and delivers the ability to interrogate website numbers down to demographics, device type and operating system to name a few. The availability of off-network numbers (on Facebook Instant Articles and Google AMP) is important as consumers increasingly discover and consumer publisher content within these closed environments. The immediacy of the data will enable campaign managers to adapt their activity in near real-time in response to audience trends. This is how it has been done on TV for years, and will now be available to digital planners. If a program does great numbers on a catch-up or online streaming service (think The HandMaid’s Tale) then a planner can see it within DCR and capitalize faster on this opportunity. The daily as opposed to monthly data means shorter periods can be analysed. This will help with identifying spikes and advertising opportunities on relevant websites in the lead up to specific events like the AFL Grand Final, Federal Budget, Oscars etc. Day of week analysis can now be done to see trends in visitation. As an example do automotive and real-estate websites really receive more traffic in the lead up to the weekend. Agencies will be able to use standardized metrics to compare across publishers both large and small. Previously some niche sites could only provide their own web analytics data. DCR will aid digital planners to evaluate smaller and niche sites, but also make decisions on which websites to initiate private marketplaces deals with. Advertisers can plan and verify campaign performance against their demographic targets as the new daily ratings also complements the existing Digital Audience Ratings product. For advertisers who still use broad demographic targets the new metrics like Unique Audience Index and Online GRP(%) will be interesting. Rankings for individual websites and categories hold less relevance than before. In the early days of digital publishers mostly sold homepages, sponsorships and run of category blocks. Digital website ratings were thus important to identify the top 1 or 2 websites to advertise on. But today consumers visit a long tail of multiple sites and apps during the day advertisers and advertisers need to follow them across them all. Advertisers are interested in chasing audiences irrespective of where they are and not by masthead/context/vertical. So the shift to Programmatic buying means ratings are not a necessary starting input because audience personas, behaviors and data are more relevant. The industry needs to move on from demographic targeting which seems arcane especially with the wealth of input signals and data available today. What is more relevant is finding prospects who are likely to buy your product i.e. have shown intent or consideration. I don’t care what the #1 website for People 18-24 is, but I want to know where people interested in a new hatchback are spending their time online. Smart digital planners value more highly the insights provided by partners like Eyeota, Signal, Quantium, Axciom etc. The data will only become valuable if publishers become flexible with how they trade. Currently pricing is usually on a Cost per thousand and rates are set arbitrarily by each publisher. A shift to a simple Cost per Reach would be an improvement as advertisers want to reach new prospects not pay based on the number of banner impressions served. Similarly if a mobile homepage has more reach than a desktop then the pricing should reflect that but it is the other way around now. Differential pricing based on day-parts and day of week would also be a big change because this is already how auction-based advertisers and programmatic works. Digital measurement systems need to evolve to become more consistent with the strategic planning process. If the comms planning output is a behavioral and attitudinal based persona from RoyMorgan then diluting it by using demographic inputs to identify relevant websites is a step backwards. If every website could be tagged up so a planner could identify the top websites by specific Helix segments or personas then that would be significant. In the last week there has been a flurry of reports on the digital marketing field in Australia. Which is good considering digital marketers like to vacillate about where digital is going and what’s tipped to be the ‘next big thing’ but very rarely stop to introspect upon ourselves as an industry and career path. I’d like to summarize some key points I picked up from the 2 press releases this past fortnight. Only 28% of respondents possessed the necessary range of skills for their role. The above points just go to show that while Australian clients have accelerated their digital investments, the underlying skills shortage and knowledge gap is only putting more pressure on existing teams and leading to under utilization of data. In my next post I’ll address some of my own observations on what’s holding back a more complete digital transformation of agencies and clients. Almost half of Australian businesses surveyed in the 2nd Nielsen-Community Engine Social Media Business Benchmarking Study plan to increase investment in the coming year. This increase is being driven by a stronger conviction of the need to be in this channel (66%) and also its targeting (50%) and ROI (40%) benefits. Top uses for SM – 50% Marketing and 30% each for CRM, Customer Service and Public Relations. In summary, it’s refreshing that businesses have moved past the stage of questioning the ROI and value of social media investments. Many businesses (31%) have reported strong or reasonable ROI returns in 2010. For Australian businesses the challenge continues to be resources – only 8% have full-time staff. 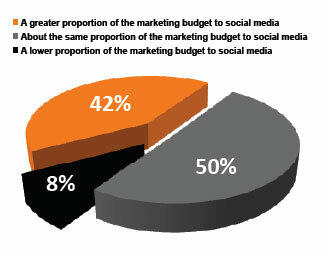 Businesses will eventually need to set up Social Media departments with separate budgets, KPI’s and staff and integrate their efforts with all other paid and owned media. Only then will businesses become more responsive and interactive like their US counterparts. In short, it’s time to go beyond the current ‘create and forget’ a Facebook presence approach.